Our hostel is nestled within the historic centre of Malaga (Spain), completely located near the Alcazaba, Cathedral and Gibralfaro Castle. Its also extremely near to Picassos house and also the Plaza de la Merced (the citys lively night-life spot). You are very close to Marques de Larios Street. This hostel has recently changed hands. They were within the process of upgrading the hostel while I was their but it was being done with their guests in mind and I suffered no inconvenience. The new owners are ardent travellers and seem to know what makes an excellent hostel. They went out of their way to bring everyone together to give a really social feel. The roof rooftop was an excellent meeting spot and they served superb value meals on certain nights. But they also realised that sleep was crucial and encouraged noiseless soon after 12pm within the hostel while organising nights out on the town. Thoroughly recommend. The people there were extremely nice and really helpful! The rooms were in the top location and really clean and nice! The staff were fantastic, along with the general environment of the hostel made everybody feel right at home. It was central and extremely straightforward to find. We slept in dormitories and it was comfortable. The employees (Iulian and Xavier) were extremely nice and helpful. We met an artist who explained us the technique of carving the wood by the use of solar light - extremely interesting. The hostel was clean and friendly along with the breakfast was an excellent begin for a sightseeing day. I would decide on this place again if I retuned to Malaga. Fun place, fun friendly guests and staff, fantastic conversation and exceptional musicians all used the public guitar well. Great location for food and drink. Low-cost restaurants, who neds to cook! Low-cost marketplace place around tyhe corner, beach a ten minute walk. Sunburn in december Cathederal, museums, Roman ruins, walking streets ful of happy individuals shops, food drink, fulbal music, whatever you could want, Picaso&s presence. Staff able to give advice about whatever malagien things. Also when I checked-out unexpactably one day before, they gave me back the money for the last night. Really fair and loyal. Great location, everything is within walking distance. Super close to good restuarants. Warm and friendly and fun staff. Perfect for what I was looking for -- a laid-back &"home base&" for a couple days to explore M&alaga and meet other like-minded travelers. The location IS extremely good, situated a brief and cozy walk from any point inside the historic center at the same time as the beach. I spot much more importance on character than on some other amenities when I stay in hostels, and I felt well-served by Picasso&'s Corner, with its bright walls, winding staircase, rooms that open onto balconies over the street, old terraces, sloppy couches and chairs, and authentic spirit. It is not a large corporate hostel, nor is it in a purpose-built building, so if you are expecting best wifi, bath rooms for each room, consistently &"professional&" staff, or completely secure entry, consider looking elsewhere. That said, wireless works wonderful inside the common area, I somehow never had trouble finding an open bathroom (even for showering -- there are one or two on each floor), the staff was exceedingly friendly and personable, and I did not feel unsafe, even when I left some valuables inside the room (the rooms have small electronic safes, huge enough for a passport and papers but not for an entire backpack). Along with the basics were covered quite well: beds were clean and high quality (including blankets), rooms were not too cramped, showers were nice and hot with superb pressure, and breakfast was toast with spreads and juices and cereal and some other things. The other travellers I met were thoughtful and friendly and I got to know some superb people. Along with the nightly dinner that one of the staffers cooks (for 5) was quite superb and a nice value, especially for a vegetarian like me. 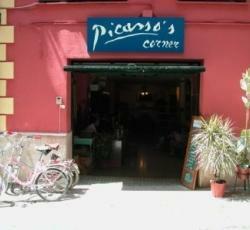 * Picasso's Corner Backpackers Hostel rated 4.78 out of 5 based on 9 customer reviews. Hostel reviews with a star rating are sourced from HostelBookers. If you find Picasso's Corner Backpackers Hostel with the same booking conditions at a lower rate somewhere else on the internet after you have booked, we will refund you the total difference.